Scripts play a major role in Oblivion modding. They handle many things and are used for many purposes; nearly every quest has a script, every trap is controlled by a script, every innkeeper that offers room is backed by a script, some unique spells have scripts - and the list goes on. Imagine, you’ve made quest, and you want it to advance to the next stage when the player has found a certain item. Or perhaps you want two NPCs to have a conversation at a given moment. Without a script, that’s not going to happen. When you finish this tutorial, you should be familiar with the basics of Oblivion scripting. It is assumed that you have at least some knowledge of the CS before you start this tutorial. 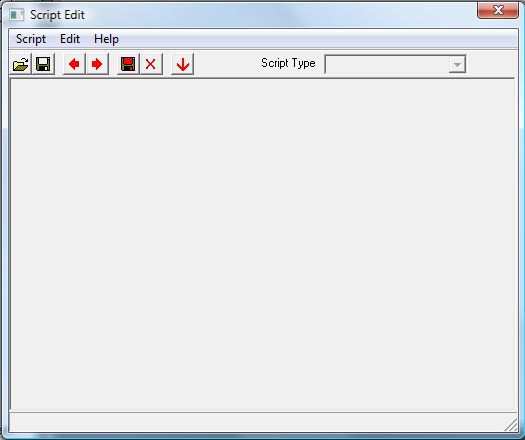 The Construction Set comes with a nifty tool for scripting: the Script Editor. This is your home while you follow this tutorial. First, let’s open the Editor by clicking the pencil icon in the upper left corner. As you can see, there are several buttons in the top left corner. Don’t be frightened by this vast amount of clickable things, you’ll only need two or three of these. Before we continue, you may want to change the size of the Editor a bit. There’s lots of space left on your monitor, why not utilize it? It’s rather small by default, which is annoying if you’re editing large scripts. Just hover your mouse over the lower right corner till an arrow appears and drag it around to change the size like you’d normally do. Now, back to that truckload of buttons we discussed earlier. The open and save buttons (first two), together with the new button under Script are the only ones you need, save the script type box, which we‘ll get to later. The open button, is surprisingly, used to open scripts. Pretty straightforward, eh? Give it a try. You’ll see lots of scripts, (unless you forgot to load Oblivion.esm) which pretty much confirms the point I made earlier: scripts are used for so many things, the game wouldn’t be the same without them. Onto the save button. Actually, save isn’t the right word. I’ve been lying to you. It’s called the “compile” button. When you compile a script, it’s processed into something the computer can understand. But don’t worry, you won’t end up with lots of 1’s and 0’s, if you open a compiled script, you’ll see it’s still perfectly readable. The other buttons are not really important. What is important, though, is that you never click the recompile all button (the one that looks similar to the compile button, but red). If you click this, the CS will recompile every script and you’ll end up with an esp several MB’s large, and tons of conflicts with other mods that touch vanilla scripts. Note that you must always create a new script if you don’t intend to touch the old one, even when you’re copying from another script. Merely changing the script’s name will not cause a “Do you want to create a new form” prompt. Now, let’s create a new script so we can continue to the next part of this tutorial. Click Script -> New. You should see the background color change to white, and you’ll be able to type into it. Before we continue, I’d like to point out that there are some useful tools such as “Find Text” under Edit. They’ll be especially useful if you’re editing large scripts consisting of hundreds of lines. where [Name] is the name of your script. Of course, it’s hard to find a script in that huge list when you need to open something. Many people add “aaa” or “zzz” or a number as a prefix to put the script on top (or on the bottom) of the alphabetical list. They often make a large mistake though; a script’s name should never, never start with a number. This is known to cause issues. Using a number after the first character is safe. If you’ve been paying attention, you’ve noticed two odd things. Firstly, the “Scn”. This is just a short form of ScriptName. It saves you some work. Secondly, the text there. Won’t that horribly confuse yhe Editor? Yes, it would, but because I put a semicolon (;) before the text, it will be ignored when the script is compiled. The compiler ignores everything after a semicolon, as well as blank lines. This way you can put comments in your scripts. Note that if you want to put a comment on multiple lines, you’ll have to use a semicolon for every line. I recommend the first approach though. It helps keep your code readable, and it’s much more elegant. After declaring the script’s name, you declare variables, which I’ll explain later. Then, you start by adding a Begin/End block, in which you put your code. A script can have multiple Begin/End blocks. I should mention that Oblivion always processes scripts from the top to the bottom (surprise, surprise). In vanilla scripting, there’s no exception to this rule, save the “Return” function, which causes script processing to go back to the top of the script. OBSE introduces several flow control functions such as “Label” and “GoTo”, but we won’t discuss those here. Before we continue, take a look at the Script Type box we saw earlier. Click it, and you’ll see a dropdown menu with three options: “Object”, “Quest” and “Magic Effect” . Object scripts are scripts that can be attached to an in game object, and you’ve likely come across them before. Note that they are attached to a base object, but that it will run separately on every instance of that object in game. Object scripts run once every frame, but only when the object is loaded (= the player is in the same cell). Quest scripts, also referred to as global scripts, are scripts that can be attached to a quest. They run once every five seconds (or whatever other value the game setting is set to), but that can be changed by using the magic fQuestDelayTime variable, which I’ll tell you about later. Finally, Magic Effect scripts can be attached to spells. Yeah, you can do that too! They’ll run when the spell hits someone/the spell effect kicks in. Begin/End blocks form the body of your script. There are several block types. The type of a block determines when the code inside it is processed. runs once every time the item this script is attached to is equipped. As I said before, multiple Begin/End blocks can be used in a script. This allows you, for example, to process code when an item, a ring, for example, is equipped and unequipped so you can “summon” a sword when the player wears the ring. There are quite a few block types, but the most common ones are: GameMode,MenuMode, OnEquip, OnUnequip OnDeath and OnActivate. I’ll briefly describe what they do, and what they can be used for. The ScriptEffectStart,ScriptEffectUpdate and ScriptEffectFinish blocks are a bit of a special case. They can only be used in magic scripts, and they will only run if the spell the script effect is applied to hits an actor. (Or, in case of a self spell, when the spell is cast.) What’s important to know is that they run on the actor they’ve hit, so calling GetSelf (I know, I haven’t told you about functions, but this has to be said now) will return the reference of the actor (or any other object, for that matter) the spell hit. Without functions, scripts would be useless. Functions make changes to the game world and are used to check what’s going on in it. There isn’t much I can say about this, so I’ll briefly explain the syntax of one of them, then provide you with some of the most common functions - the ones that you’ll need the most - and links to their respective CS Wiki pages. AddItem, RemoveItem, EquipItem and UnequipItem - they’re all functions. They tell the game what to do. Can you guess what they do? If not, get yourself checked. When I said Oblivion’s scripting language is straightforward (well, most of the time), I was being serious. [Reference] is the container (can be an actor, such as an NPC or creature, or an actual container). Note that only persistent references can be used in a script. If you need to use one, find the object you need in game, double click it, enter a reference name (which you’ll be using for [Reference]) and check “Persistent Reference”. will not work. [Count] represents the amount of the item that should be added. Of course, every function has a different syntax. This is only an example. What’s good to know, is that every functions has its own quirks and oddities. It’s always a good idea to check the documentation at the CS Wiki if you’re using a function you haven’t used before. I should also mention that there are two types of functions: active functions, and passive functions. Active functions make a change to the game world, such as adding an item to a container.AddItem is an active function. Passive functions check certain states and return the appropriate value.GetActorValue is an example of a passive function. 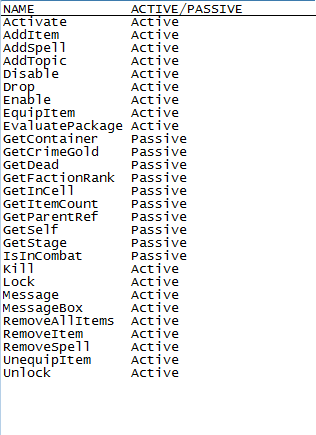 Now, as promised, a list of some of the function you are most likely to need as a novice scripter. Be sure to have a look at the List of Functions at the CS Wiki as well. There are hundreds of them, and nearly every one is documented there. If statements are the backbone of a script. They allow you to process certain pieces of code by making logical comparisons. An if statement is used to check if a condition is true, and then act to it accordingly. It always starts with “If”, then a comparison (which consists out of an argument, a comparison operator, and a second argument), then the code that is processed if the comparison is true, then the statement is closed with “EndIf”. Message "You have ten or more gold pieces. Now you can buy those fancy shoes you want." First, we check if the comparison is true, in this case when the player has ten or more gold pieces. ("Player.GetItemCount Gold001" is the first argument, ">=" is the comparison operator and "10" is the second argument.) If the statement is true, i.e. the player has ten or more gold pieces, the code between If/EndIf will be processed. Message "23 is obviously greater than or equal to 10." Obviously, 23 is greater than 10. Therefore, this returns true and the code within the if statement is processed. Message "Ten is less than or equal to the amount of gold you have. Also, I heard that Alessia Caro bought the same pair of shoes. Message "Ten is less than or equal to the amount of gold you have." If the first comparison is false, the second comparison is evaluated. If it’s true, the code between the comparison and the next ElseIf/Else/EndIf is processed and the rest of the comparison in the if statement are skipped. If it’s not true, the next ElseIf comparison is evaluated and so on. There’s no limit to how many ElseIfs you can use. The Else part is processed if none of the other comparisons were true. Naturally, an if statement can only have one “Else”. There is no limit to the amount of if statements in a script. This bit of code uses the "&&" operator to check if both of these comparisons are true. Again, in a human readable form: "Does the player have ten or more gold pieces, and is his level greater than five? If so, show a message that says...". The two comparisons are combined into one if statement. With the && operator, both comparisons on either side must be true for the code in the if to be run. So, if the players level is 3 and he has 6 coins, it won't run. But, if he has 15 coins and his level is 3, it won't be run either because only one of the comparisons is true. Message "You have ten or more gold pieces, and your level is greater than five." A nested if statement is an if statement inside an if statement. Because the code inside an if statement only runs if the comparison is true, the message will only be displayed if both if statements are true. (The second if is inside the first if, so the second if will only be evaluated if the first if is true. Thus, by putting the message in the second if, both must be true in order for it to be displayed.) Oblivion allows a maximum of ten nested if statements. Message "You have ten or more gold pieces, or your level is greater than five." The || operator will be true if one of the two comparisons is true, but also if both are true. So if the player has 12 gold pieces and his level is 1, the code within the if will be run. If the player has 12 gold pieces and his level is 7, it will also run. Only when the player has less than ten gold pieces and his level is not greater than five will the if be false. What happened in the first example is this: "Does the player have ten or more gold pieces, or is his level greater than 5?" Answer: true, because his level is greater than five. Then, the &&: "Is my previous question true, and does x equal 4?" Answer: false, because, even though the previous question was true, x does not equal 4. This will happen, because "Player.GetLevel > 5 || Player.GetItemCount BlackSoulGem >= 1" is evaluated first: "Is the players level greater than five, or does he have one or more black soulgems?" "Does the player have more than ten gold pieces, and is my previous question true?" "Does the player have more than ten gold pieces and is the player's level greater than five?" "Is my previous question true, or does he have the alternative, a black soulgem?" We've used parentheses to override the normal precedence rules. Now, the part within the parentheses if evaluated first. In Oblivion scripting, the parentheses are only needed if the default precedence rules need to be overridden. It’s better not to use them otherwise. Variables are used to store data for later use. They are stored in your saves, so you can even access them after restarting the game engine. (Note that that does not apply to all script types, but that's not important right now.) Variables are often used in conjunction with if statements to control the flow of a script, but they are also used in calculations or simply to save something, such as, for example, how much money the player has on his bank account, that needs to be accessible at all times. Long and short variables are used to store integers, i.e. whole numbers such as “5” or “34”. Float variables are used to store floating point values, i.e. numbers with decimals such as “6.8264”. You’re not likely to find a reference variable outside Oblivion scripting (in this context, at least), because reference variables refer to an instance of an object in the game. “PlayerRef”, which refers to the player, is one of them. Note that in Oblivion scripting, many people (even Bethesda itself!) use “Player” instead of “PlayerRef”. That’s wrong. If you use “Player” with a function such as GetItemCount, you’re actually referring or the player base object, not the player reference which is the one that’s running around in the game. Fortunately, the compiler will notice this mistake in most cases and swap it with PlayerRef in the compiled code. Using “Player” usually gives no problems, but if you’re doing complicated things such as checking for the player ref in an if statement, things can go wrong. It’s a good idea to use “PlayerRef” if you’re doing complicated things. “Player” will be fine with (virtually) every reference requiring functions though. I should also mention that a ref variable can also refer to a form ID/base object. is wrong and won’t compile. There are a few things you need to keep in mind though. Firstly, function return a certain kind of value. GetPos, for example, returns a float while GetSelf returns a ref. If you want to know which variable to use with a function, have a look at its CS Wiki article. will print “Var2 is 2.00”. Yes, you can print a variable by putting %.2f or %g between the quotes, then the variables’ names in the right order. You can print multiple variables in at a time, as shown above. Also, if you use %.2f, the .2 determines how many decimals are shown. For more on that, have a look at the CS Wiki article on Message. And now, the final thing I’ll be teaching you in this tutorial, and the last thing you need to get a grasp of the basics of Oblivion scripting: arithmetic operators and math. The Oblivion Script Extender, adds, besides tons of awesome functions, many new variable types, such as array and string variables, and arithmetic operators, such as ^ (exponentiation) and % (modulo). While you won’t be needing these until you’re making very complex scripts, they’re extremely useful. Arrays, for example, allow you to acquire more space to store data during runtime, without having to declare hundreds of variables and hoping that you won’t run out of them. Once you get more familiar with scripting, OBSE is definitely worth checking out. There, that’s it. You are now familiar with the basics of Oblivion scripting. (If I do my job right, that is.) If you actually read all of that, kudos, and if you actually think you have a better understanding of scripting, more kudos. Still, this here barely scratches the surface. There is so much to scripting that it can’t all be explained in a tutorial. You’ll have to experience it for yourself. At this point, you may want to have a look at the tutorials the CS Wiki has to offer. They’re all a bit specific, but you may be able to pick up a thing or two nonetheless. What I recommend though, is that you open up a few mods you’ve downloaded and dissect the scripts. You’ll learn a lot that way. Of course, the only way to master a programming language is by practice. You should now be able to string together a basic script, so fire up the CS and write some scripts from scratch. It may be hard at first, but you’ll get the hang of it in very quickly, trust me. Furthermore, if you have any questions or suggestions, feel free to either comment here, or to send me a private message. If you run into a problem, you can also post a request for a little help at CS support sections at The Nexus Forums or the Bethesda Game Studios Forums. This page was last edited on 20 November 2018, at 16:32.